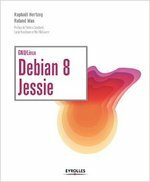 You want to start contributing to Debian and/or Ubuntu, you decided to help a package maintainer and you’re now looking for how to change a source package and how to submit your changes. 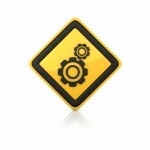 The first step is to retrieve the latest version of the source package and to install the required build-dependencies. I already covered how to do this with apt-get in the article explaining how to rebuild a source package. If you prefer, you can use dget (from the devscripts package) to directly grab the source package. You can find the URL of the .dsc files in the Package Tracking System for example. Note however that some maintainers use their VCS in a way that’s not really compatible with the explanations that I will give below. It’s also a good idea to install the package “packaging-dev”. 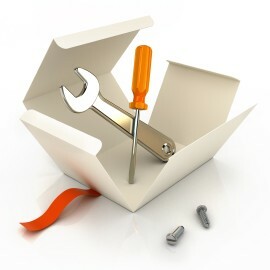 It’s a meta-package depending on the most common tools that are used for Debian packaging work. Execute dch --nmu to record the fact that you’re working on an update prepared by someone who is not the maintainer (NMU means Non Maintainer Upload). This also ensures that if we build the package, we won’t overwrite the original source package that we downloaded, thus making it possible to generate a “diff” between both versions. Now fire your text editor and do the required changes in the “debian” sub-directory. You will probably run dch -a multiple times to document each subsequent change. If you have to modify upstream files, the proper way to do it depends on the source package format (“1.0” vs “3.0 (quilt)” vs “3.0 (native)”, see the debian/source/format file) and on the presence or not of a patch system (the what-patch can help you identify it). In this explanation, I’ll assume that the package is using the recommended format: “3.0 (quilt)”. (It also works for “1.0” if quilt is used and if you configured ~/.quiltrc as recommended by /usr/share/doc/quilt/README.source). First you should ensure that all patches have been applied with quilt push -a. If there’s no patch yet, you want to create the debian/patches directory (with mkdir debian/patches). Note that you should better invoke quilt from the root of the source package (and the examples below assume this). The -P option allows to select the name of the patch file created in debian/patches/. As you see, the new patch file is recorded in debian/patches/series but not applied by default, we’re thus doing it with quilt push. Then you must record every file that you’re going to modify with a quilt add invocation. quilt then makes a backup of those files so that it can generate the patch later on. If you’re going to modify the files with your text editor you can just do quilt edit file-to-modify, it’s the same than quilt add file-to-modify followed by sensible-editor file-to-modify. You should build your modified package with “debuild -us -uc”. You can easily install the resulting package with “debi”. Verify that everything works as expected. If not, continue your modifications until you’re satisfied with the result. You can send the /tmp/wp-debdiff file to the wordpress maintainer. Usually you send it via the bugreport that your update is fixing and you add the “patch” tag to the report. This can be automated with the nmudiff utility. By default it assumes that you’re using mutt but it can also directly feed the resulting mail to sendmail. The default text that nmudiff proposes assumes that you’re actually performing an NMU and that the result has been uploaded. If that’s not the case, you should edit the text and make it clear that you’re just sending a patch. If you have been working in a VCS repository, instead of using debdiff you can simply use the diff feature integrated in your VCS (git diff, svn diff, etc.). But note that with a distributed VCS (like git/bzr/mercurial, unlike svn) you should probably have committed all individual changes in separate changesets. And instead of sending a single patch, you’re probably going to send a series of patches (though it might be easier to just upload your branch in a public repository and give the corresponding URL to the maintainer). APT vs dpkg, which one is the package manager? In the Debian world, we’re usually thinking of APT-based software when we’re referring to a “package manager”. But in truth, the real package manager is dpkg. It’s the low-level tool that takes a .deb file and extracts its content on the disk, or that takes the name of a package to remove the associated files, etc. APT is better known because it’s the part of the packaging infrastructure that matters to the user. APT makes collection of software available to the user and does the dirty work of downloading all the required packages and installing them by calling dpkg in the correct order to respect the dependencies. But APT is not a simple program, it’s a library and several different APT frontends have been developed on top of that library. 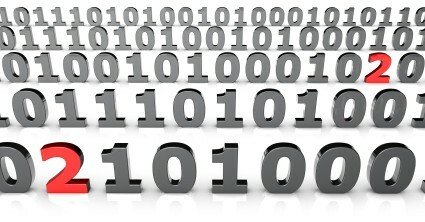 The most widely known is apt-get since it’s the oldest one, and it’s provided by APT itself. update-manager is a simple frontend useful to install security updates and other trivial daily upgrades (if you’re using testing or sid). It’s the one that you get when you click in the desktop notification that tells you that updates are available. In cases, where the upgrade is too complicated for update-manager, it will suggest to run synaptic which is full featured package manager. You can browse the list on installed/available packages in numerous ways, you can mark packages for installation/upgrade/removal/purge and then run in one go all the recorded actions. software-center aims to be an easy to use application installer, it will hide most of the packaging details and will only present installed/available applications (as defined by a .desktop file). It’s very user friendly and has been developed by Ubuntu. Of the graphical front-ends, I use mainly synaptic and only when I’m reviewing what I have installed to trim the system down. In this category, I’ll cite only aptitude. Run without parameter, it will start a powerful console-based GUI. Much like synaptic, you can have multiple views of the installed/available packages and mark packages for installation/upgrade/removal/purge before executing everything at once. This is where the well known apt-get fits, but there are several other alternatives: aptitude, cupt, wajig. Wajig and cupt are special cases as they don’t use libapt: the former wraps several tools including apt-get, and the latter is a (partial) APT reimplementation (versions 1.x were in Perl, 2.x are now is C++). You’re welcome to try them out and find out which one you prefer, but I have never felt the need to use something else than apt-get and aptitude. First I want to make it clear that you can use both and mix them without problems. It used to be annoying when apt-get did not track which packages were automatically installed while aptitude did, but now that both packages share this list, there’s no reason to avoid switching back and forth. I would recommend apt-get for the big upgrades (i.e. dist-upgrade from one stable to the next) because it will always find quickly a relatively good solution while aptitude can find several convoluted solutions (or none) and it’s difficult to decide which one should be used. On the opposite for regular upgrades in unstable (or testing), I would recommend “aptitude safe-upgrade“. It does a better job than apt-get at keeping on hold packages which are temporarily broken due to some not yet finished changes while still installing new packages when required. With aptitude it’s also possible to tweak dynamically the suggested operations while apt-get doesn’t allow this. 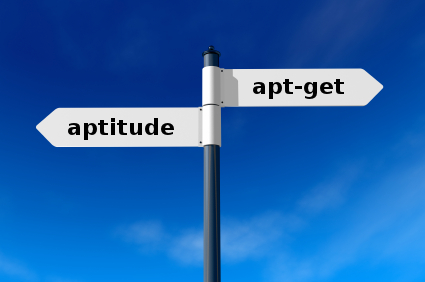 And aptitude’s command line is probably more consistent: with apt-get you have to switch between apt-get and apt-cache depending on the operation that you want to do, aptitude on the other hand does everything by itself. Take some time to read their respective documentation and to try them.